There are all sorts of reasons that it's great to be a kid (or around kids) around the holidays. They get so excited about everything and even when it's clear that you're gearing up for a green and rainy Christmas day, kids don't lose one ounce of spirit. But besides just having the big day to look forward to, kids of a certain age also have their school Christmas Concert to prepare for, although these are usually called Holiday Concerts or Winter Concerts now so as to be more inclusive. I didn't grow up going to church, so I never had to be involved with a Christmas nativity play, but if they were anything like the one described in Barbara Robinson's The Best Christmas Pageant Ever, then I think I'm alright with it. I must have been in Grade 2 or 3 when I first came across this book. I think it was read to my class a few times by various Elementary teachers who had a good sense of humour, and I'd pretty much forgotten about it until I saw it on my sister's shelf after coming home for the holidays this year. It's a short read (maybe two hours) and man, what a different book it is now. The story is kind of a classic one. In an unnamed (presumably American) town at Christmas, the church's Christmas Pageant is pretty much the biggest deal in the kids' lives. Even though the roles go to the same people every year, and the pageant plays out exactly the same way, the predictability of it doesn't diminish its importance. This year though, things are different. Mrs. Armstrong, who usually runs the pageant, breaks her leg and the narrator's mom has to take over (the narrator being an unnamed girl of about 9 or 10). Already, some of the predictable structure has changed. Enter the Herdmans. The Herdmans are six children from the bad end of town. They steal, they bully the other children at school, they don't go to church, they all smoke cigars (even the girls! ), they talk back – well, you get the idea. Basically, they are bad kids. The story goes that their dad hopped a train years ago and hasn't been heard from since and their mum is too busy working two shifts a day to really keep an eye on them, so they run wild. Basically, all the kids are kind of afraid of them. The Herdmans have never shown any interest in church or the Christmas pageant before, but this year they've heard refreshments are provided, so they turn up and then bully the rest of the Sunday school class out of their usual roles. Suddenly, the six Herdmans have the six most important roles in the pageant. Then, of course, it turns out that they've never even heard the Biblical Christmas story and have no idea what's supposed to happen in the pageant. Of course, they have lots of questions about all sorts of things (what are swaddling clothes? why doesn't anyone kill Harrod? why didn't Joseph beat up the innkeeper?) and by questioning the story, new meaning is brought to it for the young narrator. Not that the whole book is about the Christmas story – it isn't. Most of the story revolves around the antics of the Herdmans and their reign of terror over the children in the community. And it is hilarious. So is the description of the final pageant (which, as the title suggest, goes very well). The Herdmans, as Wise Men, bring a ham (from their charity food basket, no less) instead of the traditional gold, frankincense and myrrh; Mary (the oldest Herdman) burps Baby Jesus before laying him in the manger; and youngest Herdman (as the angel who visits the shepherds) yells the only spoken line in the whole play in untraditional language. It could have been a disaster, but instead it was perfect. Not being religious doesn't mean I can't appreciate the importance of religious stories and traditions. Linus' speech in A Charlie Brown Christmas is wonderfully moving, and so too is the pageant in this little story. It isn't about the religion behind it so much as it is about being overcome by the spirit and warmth of the day. And, in a whole side of the story I missed as a kid, it's about the community accepting a poor and wild bunch of kids into their annual tradition. The Herdmans are pretty marginalized and, although their antics are really funny, their lives are pretty sad; being in the Christmas pageant may have been the first time they were really expected to achieve anything, and they rose to the occasion. 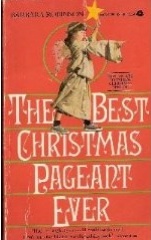 The Best Christmas Pageant Ever is not a religious story, really. Anybody who has ever participated in (or watched) a children's Christmas/holiday/winter concert will relate to the total chaos and stress that goes on behind the scenes as well as how happy and surprised the performers are when it all goes off without a hitch. These concerts are about bringing communities together and, in Robinson's story, that the Herdmans get to take part in such a central way is what really makes this such a great Christmas read.